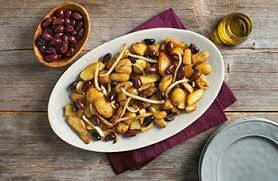 Toss fingerling potatoes and fennel with olive oil, salt and pepper on a baking sheet. Roast for 15 minutes, remove from oven, toss potatoes and add the olives, then roast an additional 15 minutes or until potatoes are golden and tender. Remove from oven and serve hot.